SHIMLA (31st January): Graffiti and posters in a high security area in Solan district cautioning people about ISIS triggering possible bomb blasts at several places today caused panic, with police saying it was not taking the issue “lightly”. 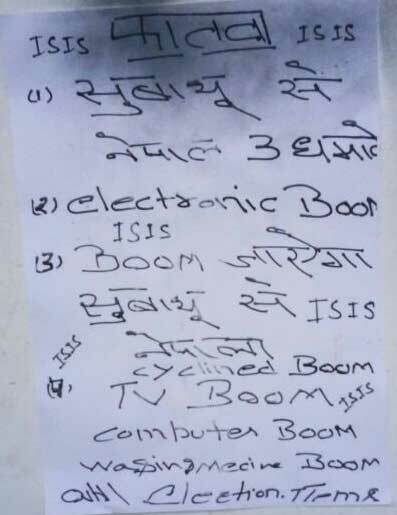 The posters and graffiti appeared at five places in Sabathu Cantonment area in Solan district, about 70 km from here, with one threatening bomb blasts from Himachal Pradesh to Nepal using washing machines and television sets. Police rushed to the spot and launched probe after registering an FIR under relevant sections of the IPC. Police sources said the graffiti was noticed at five places in the Subathu Cantonment near Solan in Himachal Pradesh this morning. The writings in Hindi and English spoke about a ‘fatwa’ issued by Islamic State Fatwa. A couple of flags with the slogan ‘ISIS zindabad’ (long live Islamic State’) were planted as well. “Fridge bikega to bamb aye ga… TV bikega to bamb aye ga,’’ was one of the slogans written on walls in the Army area. They were written with black spray paint on the gate of a park and on some walls in the cantonment at the 14th Gurkha Training Centre. A case of sedition has been registered under Section 124 A of the Indian Penal Code against the unknown persons. A team of forensic science experts from Shimla examined the graffiti. The deputy commissioner of Solan, Rakesh Kanwar said joint surveillance would be undertaken by the Army and civilian authorities to prevent recurrence of such graffiti. Similar but saffron coloured graffiti was noticed in Dharampur a few days ago. Both sets of graffiti are being compared to determine whether they were the handiwork of the same group. A few days back local people found that drinking water supplied by tankers in Sabatu and adjoining panchayats by the irrigation and public health department had been poisoned.